Now slouching over the side of my bed, I grabbed my phone and selected the album on Deezer (yes, I use Deezer…shut up). 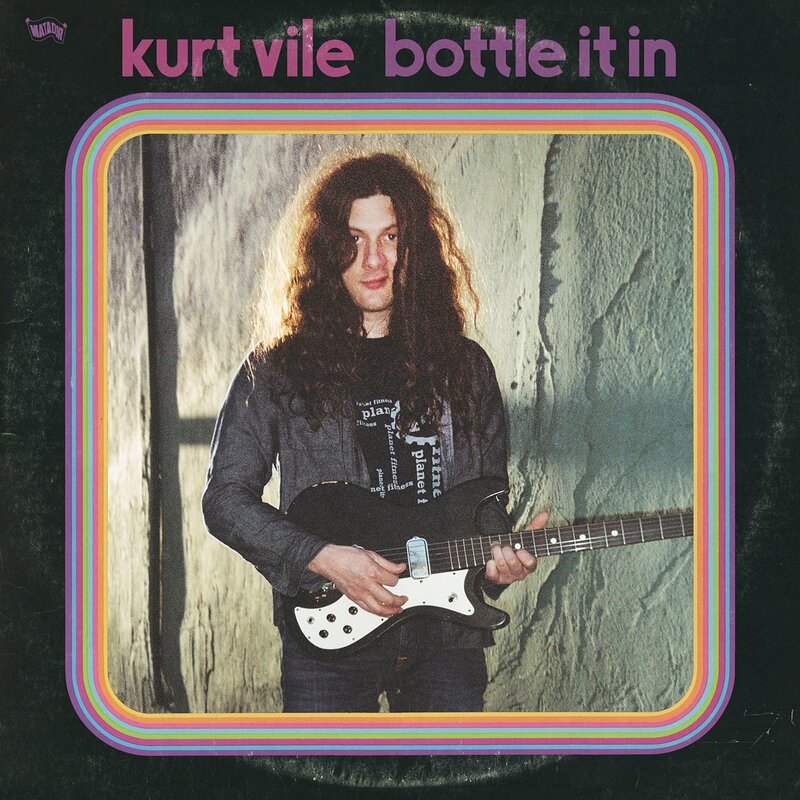 The album which is ironically called ‘Bottle It In’ because if there is anything that Kurt Vile isn’t doing on this album, it’s keeping things bottled up. Incoming ‘Loading Zones’ – the opening track which commences as I wiggle my feet into my slipper socks. Listen to me, you must remember to turn down the volume on your device before beginning. A loud and metallic ‘wah-wahing’ at the beginning of the track will yowl at you and you will fall over whilst putting on your socks. Once this frivolous croaking has subsided, a spate of melodious guitar flushes in, ushered along by poetic lyrics of freedom and evading the law in the slurred drawling voice of our Philadelphian singer-songwriter. By the second track, I’m in the kitchen, the kettle is on and my Co-op wholemeal bread is in the toaster. This one is called ‘Hysteria’. It has the same comatose, easy-going groove as ‘Loading Zones’. With crisp, flowery guitar and Kurt’s vocals more tender and lethargic, I felt like the butter oozing into the crevices of my toast. The song ended as I was reaching the end of my carbohydrate-fueled breakfast. Except it didn’t. Instead of finishing at the popular length of three minutes, an astral guitar solo slips in…followed by…two…more…verses. Time to hop in the shower. Next is ‘Yeah Bones’, an ebullient track with a jittery groove, completely juxtaposing the previous tracks. I was busy pretending I was Emma Stone in Easy A, apart from I don’t have “a pocketful of sunshine”, I have a pocket full of ‘Yeah Bones’. Lost in the carefree buzz of the song and already singing the lyrics back to Kurt by the second chorus, it would be a fair assumption to say I was hooked. It’s happy-go-luckiness got me. By this point, I was perplexed by the fact that I was only three songs into the thirteen-track album. My God, I did not know what was coming. I don’t know if it was ‘Bassackwards’ beginning or the cold air tip-toeing over my skin, but I had goosebumps upon exiting the shower. First released in September as a single, ‘Bassackwards’ is utterly hypnotic and also the fourth track on the album. A cosmic instrumental section is the greeting for the track and the next nine minutes you will be spending with it. Samples played backwards (huh) imitate gasps of breath whilst remaining tuneful and avoiding queasiness. I found myself lost for words and short of breath. A delicately thin layer of shimmering synth is added to the mix, underneath the organic loop of melancholy guitar. This song is Kurt’s empty heart. I slumped back into bed for the duration of the song, wet hair, towel and all. I would just like to reiterate now that I was then four tracks deep, soon to be five. Trotting along comes ‘One Trick Ponies’. THANKFULLY, a more lively tune. I eventually rose from my pit of sorrow and got dressed, feeling a bit better about wearing the same outfit everyday. It is undoubtedly clear by this point that Kurt Vile likes loops and looping and all things loopy — “Cause’ I’ve always had a soft spot for repetition” he sings. ‘One Trick Ponies’ fashions another chirpy, repeated guitar riff (I think I’m sensing a pattern). If you didn’t listen to the lyrics then this could well be identified as a happy song, but the lyrics have an air of loneliness about them. I heard you Kurt. The ditty of the album, ‘Rollin’ With The Flow’ got me out the door, basking in the sun, the hazy, sunset vibrato of the guitar and offhand vocals encapsulating this feeling in three minutes. I carried on listening to the album whilst running my daily errands — a little shopping, returning books to the library, admiring passing by dogs, etc. On returning home about 45 minutes later, the album was still going, I mean what’s that about? Come on. Sure, some of the best albums are the long, but by track eight, the title track, I had lost focus and with it interest. Previous [spunge] announce a UK tour with a new single.